Films will be shown at the Savoy Theater, 26 Main Street in Montpelier. Programs will not take place when the Montpelier schools are cancelled for weather. You may call (802) 479-2602 to confirm. Programs take place on Wednesdays at 1:30 p.m. (films at 12:30). $5 suggested donation per program or $40 for the 13-program series. Interacting with sources and protecting whistleblowers can be challenges to investigative reporting in VT. Examples will include the Jay Peak fraud, VT Lottery investigation, and the most recent National Guard series. Graff will explore with us the history of Great White Sharks in the Northwest Atlantic and what scientists are learning about these majestic animals returning to their home range. Lead author of the VT Climate Assessment, Professor Galford will review our future climate and its impacts on communities, natural resources, agriculture and tourism. We will hear how the VT Committee for Refugees and Immigrants has served over 8,000 refugees and those granted asylum who have established new homes in VT since 1980. The author of X: A Novel, co-written with Malcolm X’s daughter Ilyasah Shabazz, Magoon will discuss their writing process, Malcolm’s life and legacy, and how his story inspires a new generation of leaders. Humanistic Economics: Can it Save the Earth? Webster will present a case for dealing with the ills of our world by limiting the growth of “stuff” and expanding the growth of “non-stuff” using a new ecological- and humanistic-based type of economics. Valenta will lead a tour of the life cycle and habits of these smallest of domesticated animals who play such an important role in our lives even as we threaten theirs. Morris will lead us backward and forward through cartographic history to help us understand how technology has advanced our understandings through cartography. The search for spices has been a motivator of world exploration and commerce. Following explorers’ footsteps, Kaestner will trace the discovery and usage of spices from the Roman Empire through the 20th century. Author of a recent book on this topic, Parsa will discuss the 1979 Revolution and its outcomes, current challenges, and a likely path for Iran’s democratization. In the late 1940s and 1950s, hundreds were forced from the film and television industries due to their political activities. This history will be discussed and illustrated with a number of film clips. The two films described below will be shown at the Savoy Theater in Montpelier. This 2007 documentary (not the 2015 biopic) focuses on Dalton Trumbo, the highest paid screenwriter in Hollywood before losing his job in 1947. In 1960 he was the first to break the blacklist. Written in 1976, this drama—with many comic moments—was written by two blacklist victims and features Woody Allen and Zero Mostel. Set in the nascent television industry, circa 1953, it is a vivid picture of how the blacklist worked. 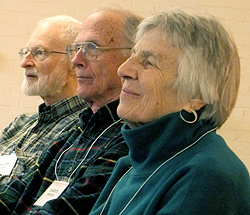 We honor the memory of Reidun Nuquist who was a leader and advocate of Central Vermont OLLI for many years.